Kodak EasyShare M873 Zoom Digital Camera Software Driver, Share Button and Firmware for Operating Systems. Note:This firmware version provides improved LED function when charging through the USB port on your computer. (Updated: 17.11.2018). 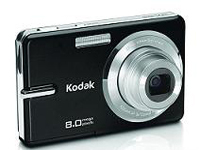 , and filed under Digital Camera and tagged kodak easyshare m873 driver, kodak m873 download, kodak m873 driver, kodak m873 easyshare, kodak m873 firmware, kodak m873 software, m873, m873 mac driver.